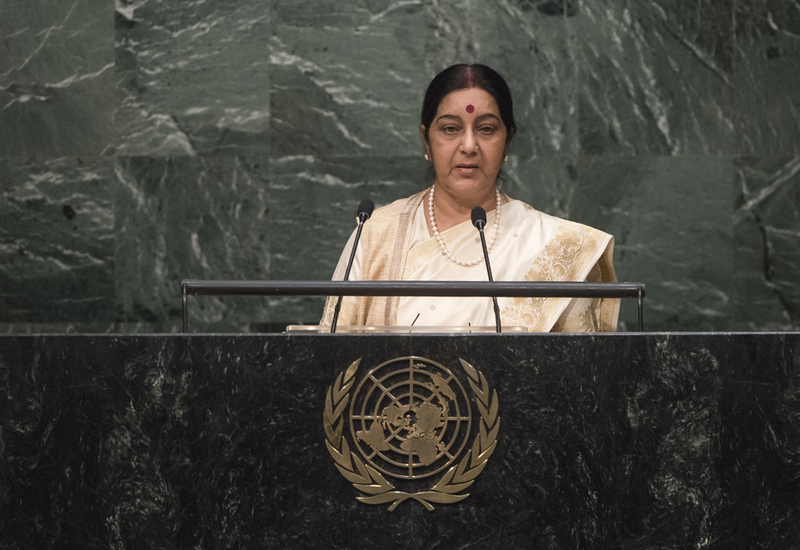 Sushma Swaraj, Minister for External Affairs of India, noting the Organization’s numerous successes such as assisting in the decolonization and dismantling of apartheid, combatting global epidemics and reducing global hunger, stressed that that the United Nations had been ineffective in the area of peace and security. She called for the urgent reform of the Security Council as a prerequisite for preserving the “centrality and legitimacy of the [United Nations] as the custodian of global peace, security”. The African and Latin American continents should be amongst the Council’s permanent members and more developing nations should be included in its decision-making structures. Turning to peacekeeping, she underscored India’s role as a troop-contributing country, noting that it had some 8,000 military and police personnel participating in 10 United Nations missions. Therefore, it was a matter of concern that there was no role for troop contributing countries in the formulation of mandates, which were often amended without consultation — a clear violation of Article 44 of the Charter. Peacekeepers faced great risks, including terrorism. That threat could only be defeated by organized international action. Countries that provided financing to terrorists or safe havens for their training, arming and operations must pay a heavy price at the hands of the international community. Calling for a comprehensive convention on international terrorism, which had long been entangled in disputes over the definition of “terrorism”, she said there could be no distinction between a “good” or “bad” terrorist. In that vein, she turned to her country’s relationship with Pakistan, stressing that no one should accept terrorism as a legitimate instrument of statecraft. Past assurances between the countries had not been honoured and new cross-border terrorist attacks had recently taken place. “We all know that these attacks are meant to destabilize India and legitimize Pakistan’s illegal occupation of parts of the Indian State of Jammu and Kashmir,” she said. Even as the world countered the menace of terrorism, she continued, it must acknowledge that real social and economic progress remained a critical goal. The elimination of basic human want would lead invariably to more peaceful societies. In regards to climate change, the world had a duty for common action but that it must keep in mind the larger historical contribution of some and the differentiated responsibility of others. In addition, adapting lifestyle choices and reducing extravagant consumption would help the world correct its course. Turning finally to the current refugee crisis, she said that a swift response backed by political will was the “need of the hour”. India’s own response to humanitarian crises in its neighbourhood had been quick and holistic. Whether the refugees came from Nepal or Yemen, India had emerged as a net security provider. Taking the floor in exercise of the right of reply, the representative of India said that it was regrettable that the representative of Pakistan had chosen to misuse the high-level segment of the General Assembly to distort reality. Pakistan claimed to be the primary victim of terrorism, but it was really the victim of its own policies of training terrorists. It was stated that Jamu and Kashmir were under foreign occupation — they were, but the occupier was Pakistan. That State apparently regretted that the dispute remained unresolved; if that was so, it was because that country had chosen to disregard its commitments under various agreements. It was always India that had extended the hand of friendship, and that offer remained open even today. Reference was made to ceasefire violations along the border line; the world knew that firing weapons was used to cover terrorists crossing the border. Pakistan was shifting its responsibility onto others. Terrorism was a “home-grown problem that had begun to bite the hand that fed it”. The heart of the matter was that Pakistan felt the use of terrorism was legitimate. All States stood by to help if only Pakistan would “wake up to the reality” of what it had done to itself.